I am so excited to kick off the holiday season this year. Last year, my daughter was born on Christmas Eve, so needless to say, we spent most of Christmas in the hospital, and once we got home, Christmas was virtually over and I felt as if I had completely missed my favorite holiday of the year! This year, the Christmas songs started playing on the radio in the car on the first day of November, and I made sure to start decorating not long after. 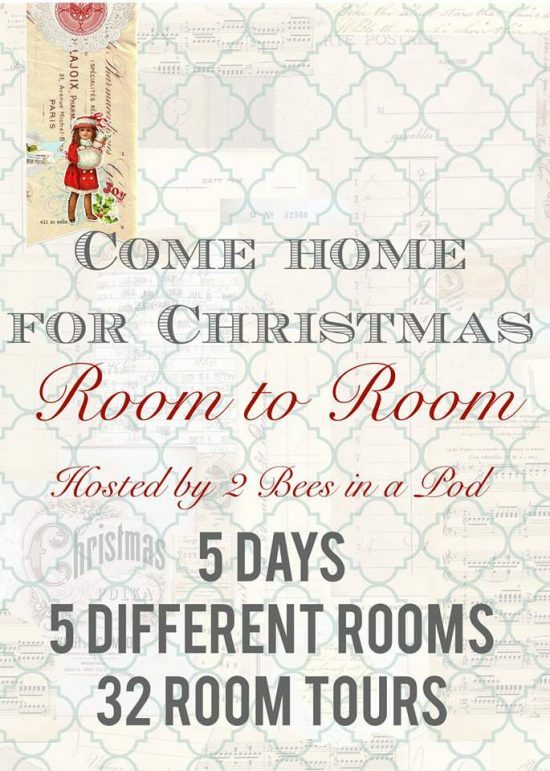 I’m so excited to be a part of the Come Home for Christmas series, hosted by Vicki and Jenn from 2 Bees in a Pod, to share my dining room with you. If you’re looking for some Christmas decorating inspiration, for any room in your home, you’ve turned to the right place! Our dining room is actually not a formal dining room, or really a room at all. It’s essentially just an eat in kitchen area. Thankfully, it’s a large enough area to fit a table that seats six, which is plenty for our family. Because of this, I rarely set the table in a full tablescape. Let’s be honest, with a 5 year old, 3 year old, and 1 year old eating at that table 3+ times per day, it would be a nightmare. 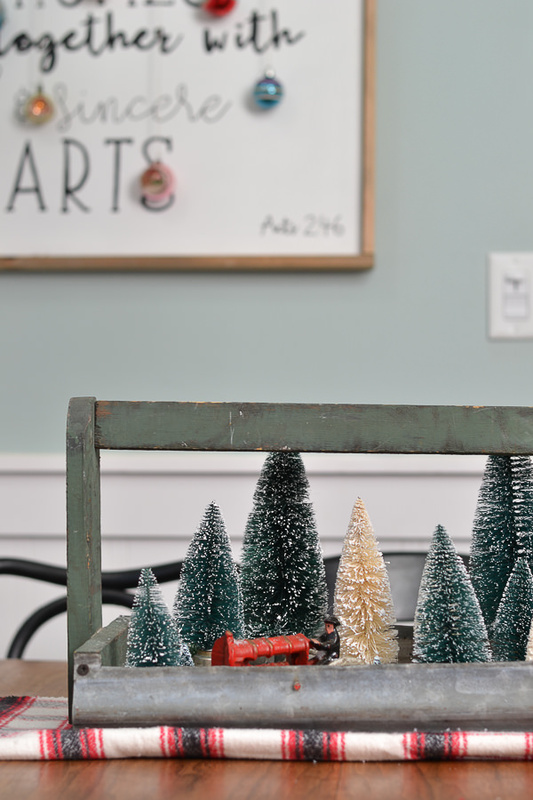 Instead, I love to change out the centerpiece for different holidays, and find ways to decorate around the rest of the room. 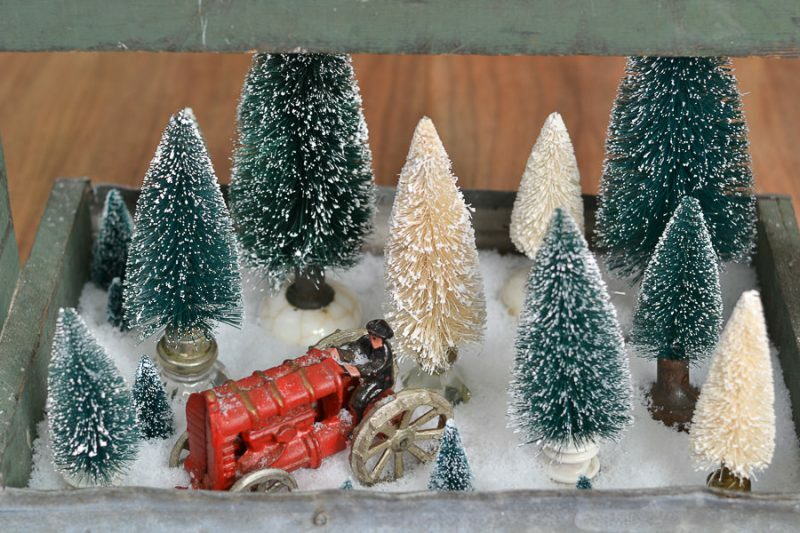 I put my bottle brush trees in vintage doorknobs last year and loved it. I think every year I put out bottle brush trees, they’ll be set in doorknobs from here on out. 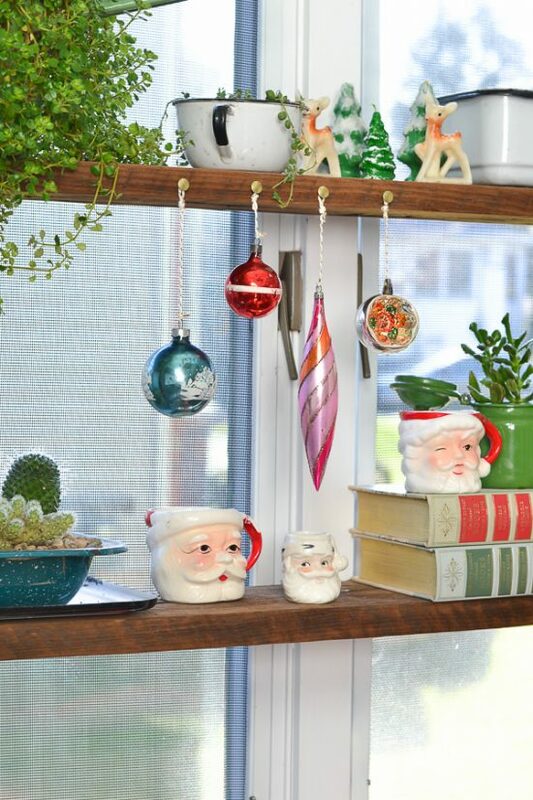 The window shelves were so fun to decorate with my vintage estate sale finds. I’ve been picking up these santa mugs every time I see them at a sale. I also love the candle figurines, too. I think vintage ornaments speak for themselves. They are SO pretty! This was the first year I started picking them up at estate sales, but I’m pretty certain they are going to become my new collection obsession. I’m too lazy to change out large signs and artwork in my home, so I just updated this sign (here’s how I made it) for Christmas by hanging ornaments right from the frame. It’s all quite simple, but works well for our family, and our space! Seriously – I love these little guys! 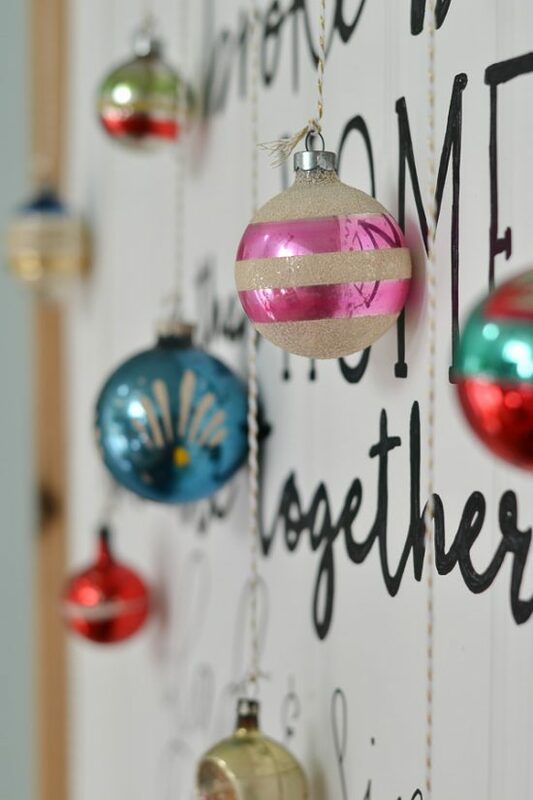 Head on over to check out all the other beautifully decorated rooms – all ready for Christmas! 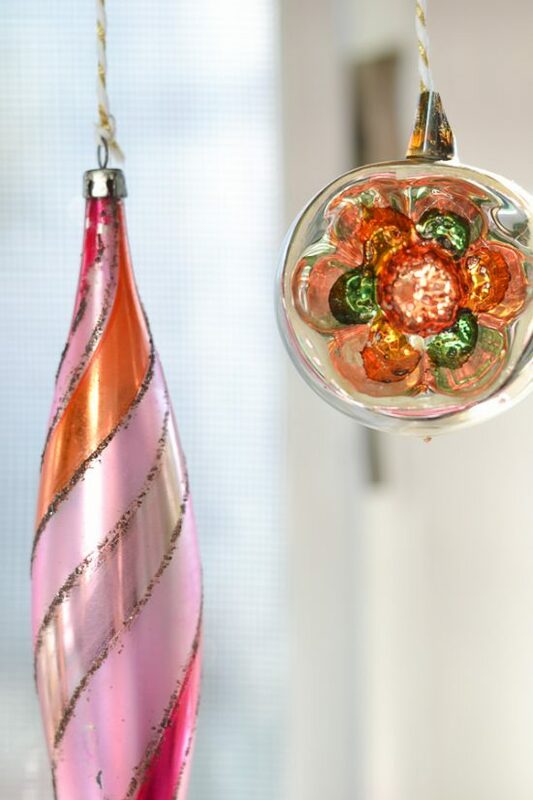 When I get home I am going to eye up where I can hang ornaments like that, I love it and it is easy using what I have. (I have a New Years Day baby, giving that lost holiday plenty of fun over the years!). So you totally understand! I’m wondering if over the years I’ll start to have vintage ornaments hanging from everywhere in my home. 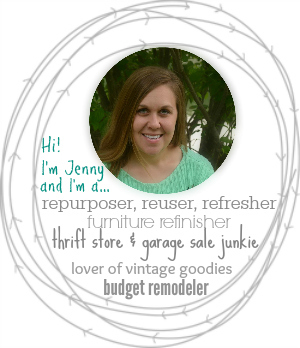 Jenny, the bottle brush trees in doorknobs is brilliant! Pinned so I’ll remember for next year 🙂 I love your vintage ornaments and how you’ve cleverly displayed them out of the reach of tiny hands but visible for all to enjoy! Thanks Cindy! Out of reach of tiny hands was definitely the plan. Merry Christmas! I don’t have a full tablescape for the same reason! #reallife It looks great! I still love your light fixture! Those trees in the centerpiece are adorable! Merry Christmas! Thanks Meg! I was just looking at it the other day and wondering if it was time to switch up out?! 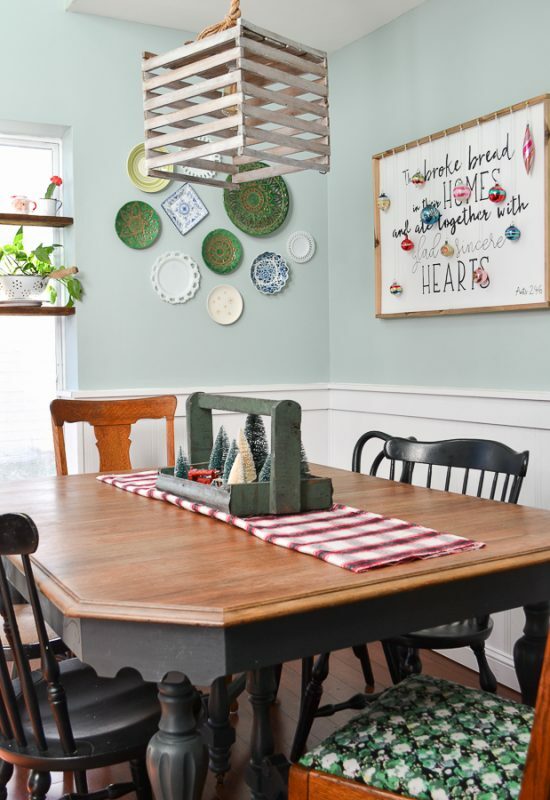 Your dining room is so cheerful for the holidays! I love all of the colors ! Bottle brush trees are one of my favorite Christmas decorations! I LOVE how you put them in vintage door knobs! So cute! Your dining room is beautiful! Thanks Nicole! I have way too many doorknobs stored in my basement so it’s a nice excuse to pull them out. I love your ornaments hanging from the frame. I may do that on my chalkboard! Love your cozy room. Yes! I think it would awesome on a chalkboard! I need you to take me estate sale hunting with you! You find good things; I find nothing!!!! Love the vintage touches that you’ve collected. 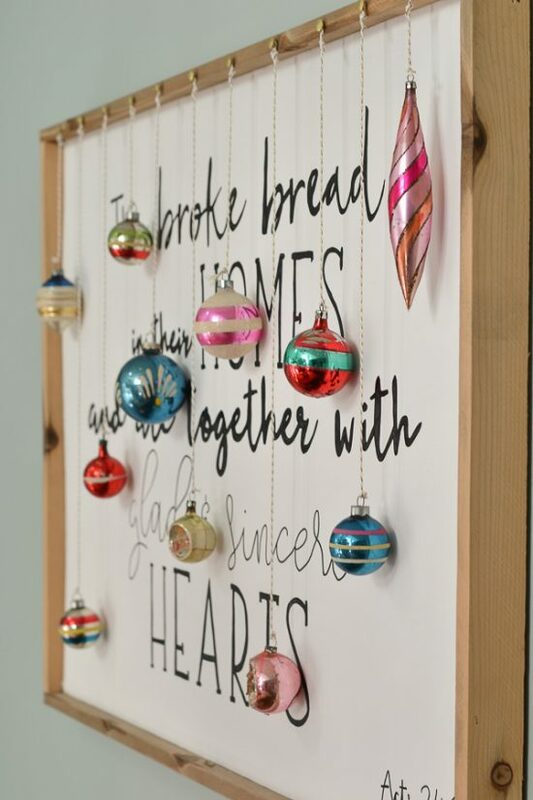 Such a great way to make the space festive while accommodating your family. Merry Christmas, Jenny! We really should go together! I only go to the ones that look like the person has lived in the house for over 50 years – there’s always treasures that have been stored away. Merry Christmas!! 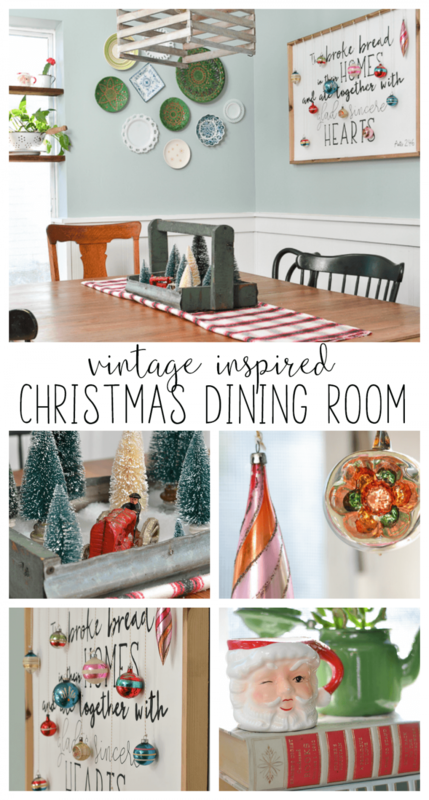 Your Christmas dining room looks beautiful Jenny! 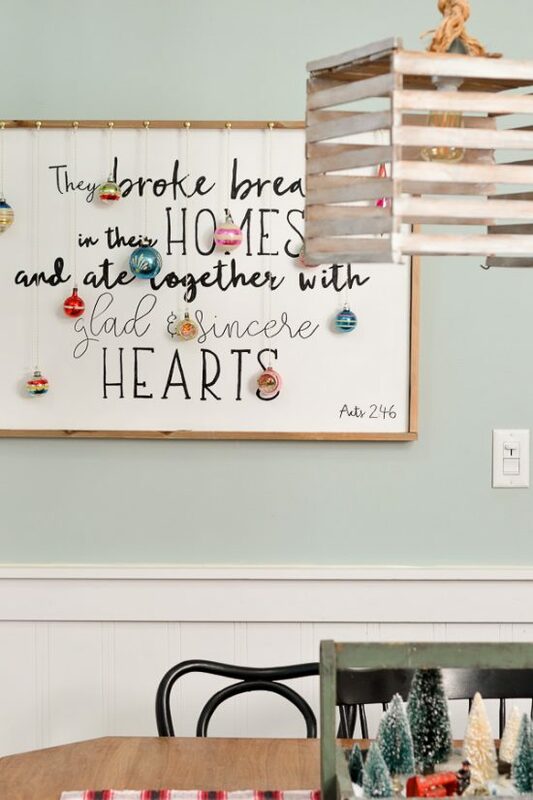 Love your sign with the ornaments hanging over it and the bottle brush trees on your dining table! This makes my vintage loving heart happy! This is so beautiful! Those bottle brush trees are the cutest! Oh, how I love vintage loving hearts! Thanks Jen! You’re so sweet, CoCo! It’s amazing how quickly the years fly by, isn’t it? SO pretty! LOVE all those fun pops of colour! 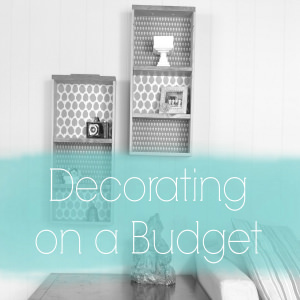 Love your centerpiece and that is a brilliant idea for not having to change out large wall art pieces. Love it! Thanks so much, Rachel! Now I’m thinking about how I can update for other holidays too. I just love your centerpiece – I may be stealing that idea for the holidays. And your collection of vintage ornaments is the best! Happy Holidays! Hi Kristy. Feel free; I’m glad you like it!! Those vintage ornaments are amazing!! They remind me of some my parents have. I love your bottle brush trees, too – the doorknobs are a great idea! I hope you’re able to enjoy some wonderful holiday meals here this year! Thanks Emily! I love how vintage stuff always seem to remind people of others or places. So fun! Those little doorknob bottle brush trees are darling! Such a cute idea! Love how you hung the vintage ornaments from the sign. 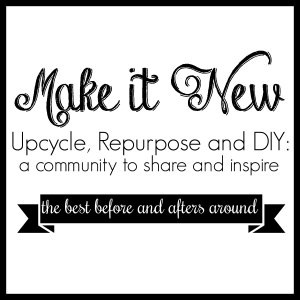 So many great vintage finds!